As the calendar turns and we start the beginning of the fall season, we want to highlight one of our big successes so far, the Big Fall Cleanup. 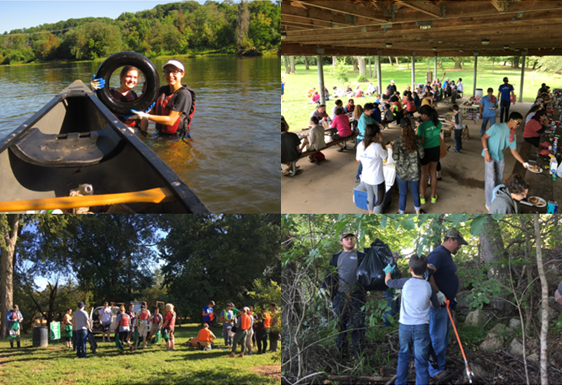 On September 9, we were delighted to have 19 sponsoring organizations and hundreds of community volunteers come together to celebrate and clean the Rappahannock River. The Big Fall Cleanup boasted 275 volunteers across 15 teams stationed throughout Fredericksburg and Spotsylvania. Clean up sites included: the Canal Path, Old Mill Park, Sophia Street, and in and along the Rappahannock. Volunteers for the Big Fall Cleanup spanned from families sharing community service with their children, to youth service organizations like the Church of Jesus Christ of Latter Day Saints YSA, to companies like Geico and the RPI Group giving back while practicing team building. After two hours of hard work, the volunteers and staff came together for a catered barbecue lunch at Old Mill Park courtesy of Dickey’s Barbecue Pit, to celebrate the morning’s accomplishments. After the dust settled, our dumpster weighed over 6,000 pounds. That weighs almost as much as one and a half cars! We encourage other groups and businesses to organize cleanups in their local community. For more information or to volunteer, please check out this link.